The letter of the day is M and that gives us two great farm blogs — Messy Kennedy and Minnesota Farm Living. 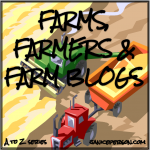 What makes a great farm blog? Farmers who are not only raising food & fiber for people in their communities, but they take the time to share it online! Messy Kennedy is the name of the farm blog Ashley Messing-Kennedy (hence where Messy Kennedy comes from) writes! She and her family farm in Bad Axe, Michigan — producing milk, beef, black beans, corn, wheat and hay. She’s a long time social media friend! I still think about how much I learned by going to a dairy conference up there and I had a chance to see ice sculptures in Frankenmuth. And some of you may remember her guest post on cotton’s role with dairy. We have lots of robots on our farm. We have robots that milk our cows, robots that feed our calves on milk and a robot that keeps the food pushed up to the cows every hour! 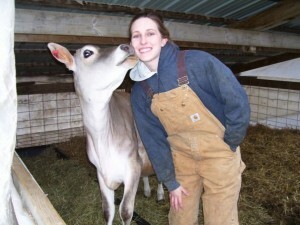 I was born and raised on my family’s dairy farm but I didn’t always love farming. When I was in grade school I swore I would never marry a farm and I hated the farm. You know what they say about never say never. Once I got older I accidentally only dated farmers and farmers sons so I accepted my fate and fell in love with the lifestyle, the farm and the cows. I am so in love with the family lifestyle that farming offers. Not very many people can say their family has been in an industry for 7 generations. I cannot wait to raise a family on our farm and pass down this love, even if they decide that farming isn’t exactly for them. I love that in the same day I can work with my grandparents, my parents, my brother and my husband depending on what they day brings. This is such a tough one because I believe every person is put in your life for a reason. Obviously my parents are greatly influential but I won’t go that route because I talk about them a lot. I would say Dr. Joe Domecq. He was my academic adviser at Michigan State University in my Dairy Management Program. He taught me that it is okay to be a strong, intelligent woman. He ground it into my head that being what is expected of me as a woman in agriculture is overrated and beneath me. He was one of the first people to tell me that I was too smart to just be ordinary and it has stuck with me all of my life and I always try to push myself to be better than I am today in everything I do. My husband’s parents farmed where they grew corn and soybeans and milked cows. My husband did not want to continue milking cows. 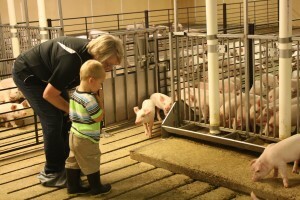 He was fortunate for an opportunity to raise pigs. A veterinarian owned a building site close to where my husband grew up and asked him if he would like to help him raise pigs on that site. He said yes. We eventually purchased the pigs from the veterinarian and started to build our own herd. In addition to the pigs, we rented and purchased land to build our cropping enterprise also. I never grew up on a farm and really didn’t want to live on a farm (haha). My best friend lived on a pig farm and when I would stay overnight at her house, she would still have to do pig chores, which meant cleaning out the pig pens with pitchfork in hand. I watched her do her chore one morning and I said to her, “I will never marry a hog farmer!” We still talk about that! The lesson? Never say never or God has quite the sense of humor! Feeding families. I have a sign at the end of our driveway that says, “Our family is proud to feed yours”. There is nothing better than knowing the food we are raising is for other families. It’s very humbling and also a very significant responsibility. We truly are proud of what we do and do the best job we can and am always looking for better ways to grow our food. 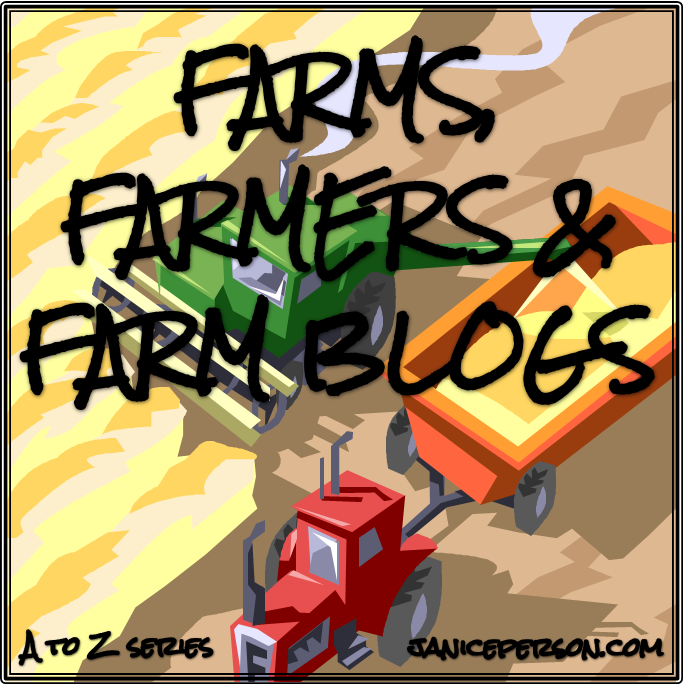 This posts means we are at the half-way point in the Farms, Farmers and Farm Blogs in this A to Z series! I am so pumped that I have gotten this far on schedule and I feel like it is possible for me to complete the challenge! It’s not a done deal mind you, but I think it is possible! If you are reading…. can you share something that has grabbed your heart or head in the posts so far? Do you have ideas I should keep in mind? Thank you so much for featuring me today along side another great farm blogger! You are welcome! Thanks for making it so easy!